Maloney is running for Senate. (CNN) - New York Rep. Carolyn Maloney, a Democrat, apologized Monday for using the N word in a recent interview while recounting a phone call she had received. "I apologize for having repeated a word I find disgusting," Maloney said in a statement. "It's no excuse but I was so caught up in relaying the story exactly as it was told to me that, in doing so, I repeated a word that should never be repeated." Maloney, who is challenging Sen. Kirsten Gillibrand for the 2010 Democratic Senate nomination in New York, used the full racial slur in an interview with the Web site City Hall while taking aim at Gillibrand's record. "I got a call from someone from Puerto Rico, said [Gillibrand] went to Puerto Rico and came out for English-only [education]. And he said, 'It was like saying n-r to a Puerto Rican,'" Maloney said. "I don't know-I don't know if that's true or not. I just called. I'm just throwing that out. All of her-well, what does she stand for?" Earlier Monday, the Rev. Al Sharpton - a supporter of Gillibrand's bid - sharply criticized Maloney for using the word. 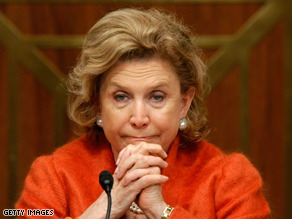 "The quote by Congresswoman Maloney if accurate is alarming and disturbing at best," he said in a statement. "No public official even in quoting someone else should loosely use such an offensive term and should certainly challenge someone using the term to him or her." The controversy comes the same day Maloney is set to hold a big-ticket fundraiser that includes an appearance from former President Bill Clinton. Clinton has also attended a fundraiser for Gillibrand.